Moving from the cleanroom to the Cape Canaveral launching pad, the next update to the U.S. military's space-based communications network was hoisted aboard its booster rocket Wednesday. The Wideband Global SATCOM 4 spacecraft, better known as WGS 4, will ride a United Launch Alliance Delta 4 rocket into orbit Jan. 19 from the Florida spaceport's pad 37B. Liftoff will be possible during a 93-minute window extending from 7:38 to 9:11 p.m. EST (0038-0211 GMT). 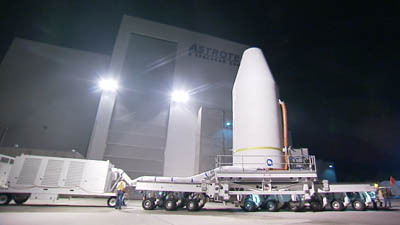 Already tucked inside the rocket's five-meter-diameter, 47-foot-tall nose cone, a process that was accomplished before the holidays while still at the spacecraft preparation facility in Titusville, WGS 4 was driven on a specialized transporter across the river, through Kennedy Space Center and over to Complex 37 in the frigid predawn darkness Wednesday. After entering the pad and climbing the ramp to the launch site around 3:30 a.m. EST, the motorized hauler was parked on the backside of the mobile service gantry to complete the 25-mile trip. There, the pad's crane lowered down to take hold of the payload for carefully hoisting the 6.5-ton satellite into the tower and positioning it atop the rocket's second stage for attachment. 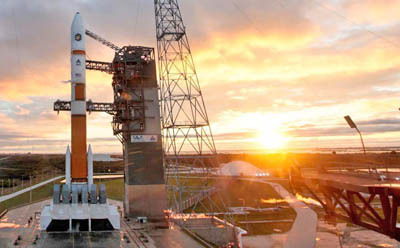 The milestone move kicks off the final two weeks of the pre-launch campaign, which will include integrated testing between the Delta 4 rocket and WGS 4 spacecraft, closeouts of the vehicle compartments for flight and a series of readiness reviews to verify all systems are "go" for blastoff. 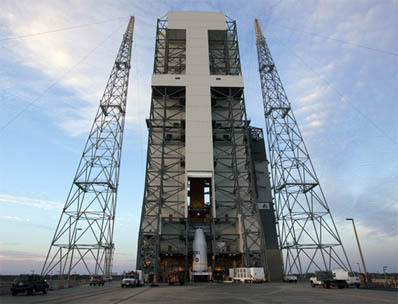 It will be first rocket launch from Cape Canaveral of the new year and begins the Delta 4 rocket's 2012 that is dedicated to military service with as many as five flights scheduled from both Florida and Vandenberg Air Force Base in California to deploy WGS, GPS and classified National Reconnaissance Office spacecraft. WGS 4 starts an enhanced "block" of satellites with improved bandwidth for communications to the military's remotely-controlled unmanned aerial drones, which are used for surveillance, intelligence-gathering and offensive operations. The Air Force says it plans to put this WGS 4 spacecraft into service over the Middle East and Southeast Asia for U.S. Central Command and U.S. Pacific Command. Weighing about 13,000 pounds at launch, the craft's communications package provides shaped, steerable spotbeams of bandwidth wherever requested across its field-of-view for Ka- and X-band frequencies, plus the onboard capability to convert signals from one band to the other. The data transmission rates range from 2.1 to 3.6 Gbps. Once fully unfurled in space, the craft's solar-power wings will span 134 feet. Three WGS spacecraft are operating in geosynchronous orbit today, and The Boeing Co. has four more in production at its El Segundo factory in Los Angeles. The craft are built upon the company's powerhouse 702-model design. For over four decades, the Defense Satellite Communications System was the foundation for flowing secure information to military forces around the globe. But that heritage system is being phased out as the aging craft retire and the new WGS satellites ascend to orbit to take advantage of new technology. Each WGS bird possesses 10 times the capacity of a DSCS satellite and offers 19 coverage areas with its steerable antennas versus 8 under the heritage craft. At the heart of each WGS is an internal box called a digital channelizer that enables a user with a Ka-band terminal to seamlessly connect to someone with an X-band terminal, or vice versa. 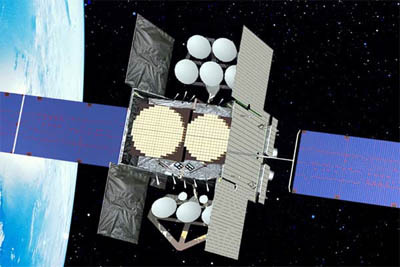 But the new Block 2 satellites, beginning with WGS 4, come with a bypass feature for unmanned aerial drone communications to skip the crossbanding path and use two uplink and two downlink channels that offer three times the bandwidth as the normal channels, opening up a much wider pipeline for data to flow. The Delta 4 carrying WGS 4 will be flying in the Medium+(5,4) configuration, which is the most powerful of the Medium-version rockets and below only the triple-core Heavy in the modular family's lineup. 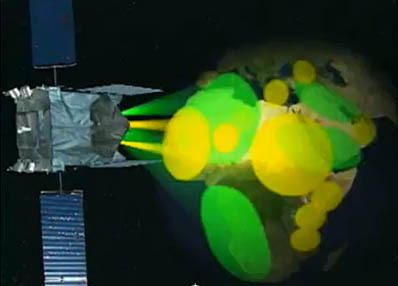 The Medium+(5,4) has a five-meter-diameter upper stage loaded with more cryogenic propellants than the optional four-meter motor used for other launches, such as GPS missions. The rocket also has a full set of four solid-fuel boosters strapped to the first stage, double the number used for GPS and other lower-weight payloads. The first stage is powered by the RS-68 hydrogen-fed main engine and the upper stage has the RL10B-2 engine, the powerplants used on all 17 Delta 4 missions to date. With WGS 4 now aboard, the fully stacked rocket stands 217 feet, 7 inches tall and looks ready for blastoff in just 15 days.